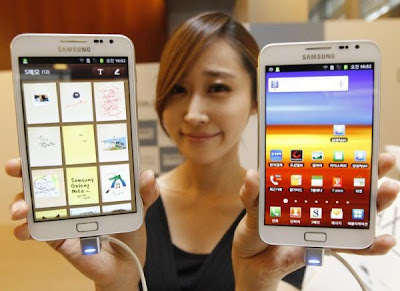 SEOUL: Samsung Electronics posted record quarterly profit of $5.15 billion, driven by booming sales of its smartphones and the Galaxy Note ‘phablet’, which it hopes will show it has a flair for innovation to match rival Apple Inc. The Note - part phone, part mini-tablet - with a throwback stylus and screen half the size of the iPad, has sold more than 5 million since launching in October, and is proving a surprise money earner for the South Korean electronics giant that has a reputation as a ‘fast follower’ rather than design leader. Samsung, which raced to the top of the global smartphone rankings last year with close to a fifth of the market, from just 3 percent in 2009, is set to go head-to-head with Apple this quarter with the expected launch of a revamped Galaxy S, its flagship smartphone, and Apple’s next iPhone. The Note sits somewhere between a small tablet and a big smartphone, and its early success illustrates that a maturing mobile device market can open up new opportunities as users and manufacturers experiment with form. 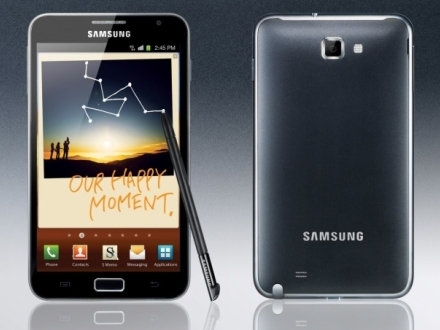 Samsung has driven the Note with its marketing and distribution clout. Put together by Samsung’s design chief Lee Minhyouk as a smartphone ‘taboo breaker’, the Note increases the pressure on gadget strugglers HTC, Nokia and BlackBerry maker Research in Motion.